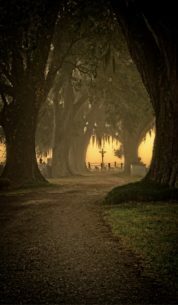 The historic cemetery in Grand Coteau, LA was bathe in a foggy sunrise which provided this amazing glow behind the iconic crucifix among the great oak trees. What a beautiful photo. Great capture!